Bryan Welsh, 82, scored his fifth hole-in-one at the Pleasant Point golf course, driving the No.2 hole. 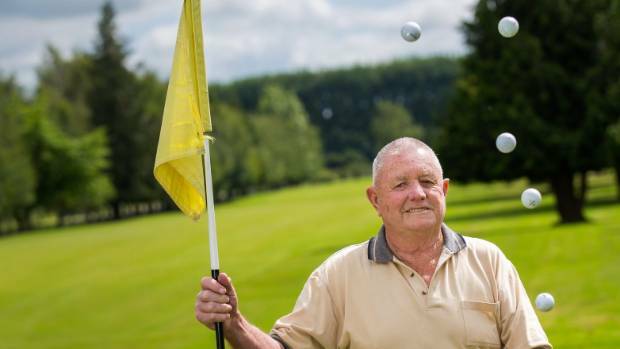 A pending hip replacement did not stop 82-year-old Bryan Welch hitting the perfect shot - again. with his driver to notch up his fifth hole-in-one. Welch struck his first on the same hole 47 years earlier, but admitted using a much smaller club. His other aces were at Temuka, Cromwell and a third at Pleasant Point. Welch said there was no secret to it. "You just need to hit the ball straight and have a bit of luck." Welch did not see the ball disappear this time because of mounds in front of the green. and hole so carefully pulled the flag out sideways and it fell in." Welch took up golf in his early 30s after workmates on a farm at Waitohi used to hit golf balls down the paddock. "I have really enjoyed it, it's a lot of fun. Mixing in with others is great." As for his five successful swings, Welch said the best part was his best mate Gordon Smith had never had one. "I keep telling him it's the easiest thing to do, you only need one swing." He doesn't have a favourite club in his bag but uses his rescue quite a lot. "It's well named as it gets me out a bit of trouble sometimes. "My putter used to also get me out of trouble but these days it seems to get me into more." Welch plays off a 36 handicap and hopes to get it down after he has recovered from his operation. "At my best it was nine, then around 14-16-18, but with the hip its gone way out." He has also resorted to using a cart to get around the course, with his hip replacement due on Friday. Welch said he still enjoys Saturday golf but Thursdays are his favourites as it is a bit more relaxed. His favourite round, however, is once a month when he plays with three other octogenarians, aged 89, 86 and 83. "It's a great day, we poke a bit of fun at each other. That's what its all about, I really enjoy it." does not make him the most successful. "I thought I was but president Alton Mangum is one ahead on six. I'm still in the top bracket." Welch said his wife, Shirley, did not play but didn't mind golf at all. "Her favourite was Tiger Woods but she been a bit cool on him lately." Welch was a handy sportsman in his younger days, playing rugby and was undefeated as a heavyweight in tug-o-war. Detective Andrew Beswick of Christchurch got a hole in one at the second day of at the 2017 New Zealand Police Association Golf Championships in Pleasant Point on Monday. On Monday, the first hole in one for the competition was sunk by Detective Andrew Beswick, of Christchurch, Pleasant Point Golf Club president Alton Mangum said. From 151 metres on a three par hole, the hole in one was sunk. It was "pretty unusual," he said. From 8am each day officers had been competing across three grades - senior, intermediate, and junior, he said. He said 83 police men and women from all over the country had completed 27 holes on Sunday and Monday, with the last 18 holes of golf being competed on Tuesday. Senior Sergeant Dylan Murray, of Timaru, said each policing district hosted the competition on a rotation. He said the event was "serious but fun". "It's very serious, there are trophies on the line." It was a good chance for officers from different districts to meet and catch up over a round of golf, he said. It was good when you go to work in other areas and "you know some of your golfing mates," he said. There were seven local officers from the Mid-South Canterbury area competing and he was hopeful one of the locals could bring home the 2017 title. He said Constable Kris Howes, of Pleasant Point, was "our best golfer" so all eyes were on him. A break up and prize giving would be held on Tuesday night at the Timaru Town and Country Club. Pleasant Point Golf Club secretary Brenda McEwan said the club was happy to be able to host the tournament. "We are very happy to host people and take care of them." It was not the first time the competition has been held in South Canterbury, with it being held in Timaru in the past. 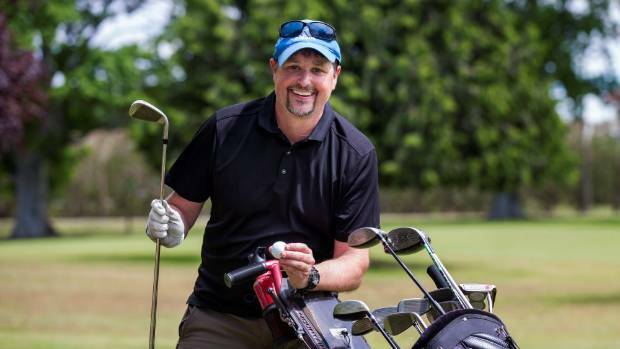 Marcus Tessier was representing South Caterbury in a golf match against Mid Canterbury when he hit a hole-in-one on the 16th hole at Highfield Golf Course. Marcus Tessier notched another hole-in-one at Highfield Golf Club - a day after his 29th birthday - to cap an unforgettable weekend for the South Canterbury sports enthusiast. "It was hectic really. My son had his first birthday on the Monday, so it was a full on three days," Tessier said of his sporting feats on August 12-13. "I also played two games of basketball on Sunday evening so was glad I took the Monday off work." It was his third hole-in-one in a golf career that has spanned about 15 years. "I'm certainly going to remember this one as there were about 15 to 16 watching as the green leads on to a couple of other holes. "It was certainly well celebrated." His previous hole-in-one's came about 11 years ago at the Twizel Golf Club, on their two par 3s. Tessier's latest effort came on the par 3 16th at the Highfield Golf Club. "The hole was playing about 140 and I did a three-quarter nine iron and it landed on the green and then rolled towards the cup and found it. "People told me it fell in the dead centre of the cup, pretty much like the perfect putt does." While the hole-in-one will be remembered for years to come, it came a hole too late for Tessier. The Pleasant Point Golf Club member was playing in a North (Mid Canterbury) against South (South Canterbury) Aorangi representative trial, and had lost his match on the previous hole. "In the context of the match it would've been awesome if it came a hole earlier as it would have kept me in the clash with a few holes to play. "I was just getting to know the course and then the hole-in-one occurred." The success from his ace in the morning spurred Tessier to win his afternoon fixture. The 2.6 handicapper is hoping to reach scratch and said he'd love to play representative golf if given that chance. "It was really good. I got to meet a lot of different players. "Hopefully I can get the opportunity to play for Aorangi and then see where my golf takes me." He was first introduced to a club while watching his dad play, and wanting to beat him was the motivation to continue playing. "I managed to beat him and have just carried on playing. I love the game, it's my favourite sport." Earlier in the year, Tessier also claimed the Hospice hole-in-one challenge as his effort was closest to the pin. After his long day at the golf course, Tessier suited up to play two back-to-back games for Blue Magic in the Timaru men's basketball competition. 29/03/2019 Paul King Par 3 - No 16 at Pleasant Point - of the blue tees. Hole in one on the 16th! If I didn't know better I'd say he almost cracked a smile...2nd hole in one but his 1st at Point in 48yrs of playing there.